Started this discussion. Last reply by Michael Cannon Sep 5, 2010. Started this discussion. Last reply by Vandit Kalia Aug 20, 2010. "I ended up ordering tires, tubes, liners, clothes and other kit from CRC. They're shipping to India for about 2,000 Rupees. Also, the tires were much cheaper. http://www.chainreactioncycles.com/Models.aspx?ModelID=18800"
"I've ordered tires and components from Wiggle (UK) a couple of times. Good service. Delivery to India via Royal Mail. Check out this link for Gatorskins -…"
"Narayana said size 54, Tiagra gruppo"
"This Bianchi is a mix carbon rear stay and fork with aluminum base frame running Shimano 105 gruppo." 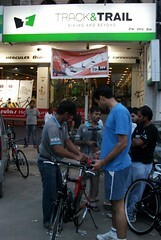 "You can get one of your own by getting a hold of Arif at the Lajpat Nagar Track & Trail bike shop." "It's Michael's Trek bike that was converted to TT style. For the long flat rides around Delhi, I'd imagine you could stay down comfortably for a while unless your engine gives out." "naiceeeeeeeee....... is it d equinox????" Michael Cannon commented on ReCycle's blog post What Bike do YOU own? "My current major ride is a Masi Caffe Doppio Racer bought in Taipei, Taiwan for about 46,000 Rupees. It's carrying Ultegra rear derailleur and mostly 105 otherwise. Carbon fork, 700c x 23 red trim tires, and a rear rack for commuting pretty…"
Michael Cannon commented on Pradeep Simha's blog post Any Cycling group in Goregaon? "Pradeep, I'm in Gurgaon DLF Phase II looking for long rides on weekends. I'm heading out sometime tomorrow. Not sure if early morning or early afternoon, but would like to see some countryside and cover 100 kms. Michael"
"What size and gruppo does it have?" "This bikes geometry and gruppo is decent enough to make it a good criterion style ride. That's a reason why I'd be interested in it myself for an alternative to my Masi Caffee Doppio Racer when I want speed rides." "Would it be possible to have it shipped to Gurgaon? I'm interested in having another road bike up here." Peichi’s man, adventurous water rat & TYPO3 support guru who’s living simply, roaming about & smiling more. I finally got a quick morning ride in. It was shorter than intended due to taking a left turn too soon. However, it’s definitely at the top of my list for interesting short rides. Starting out this rain cooled morning I encountered the workers and servants heading to work. What do you do on the first Sunday in a new city on the other side of the world? 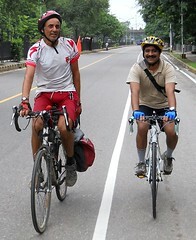 Well, I went biking at 6 AM with bike shop Track & Trail of Lajpat Nagar for their first group ride ever in Delhi India. Hi! Sorry for the late reply I was busy for the past few days. Are you still interested in the bike? 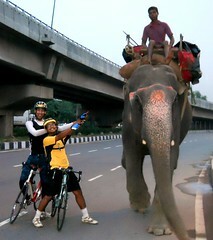 Btw, check out bikeszone.com as well to get leads on where to get bike schwag in India.